12 Now this will be the plague with which the LORD will strike all the peoples who have gone to war against Jerusalem; their flesh will rot while they stand on their feet, and their eyes will rot in their sockets, and their tongue will rot in their mouth. 13 And it will come about in that day that a great panic from the LORD will fall on them; and they will seize one another's hand, and the hand of one will be lifted against the hand of another. 15 So also like this plague, will be the plague on the horse, the mule, the camel, the donkey, and all the cattle that will be in those camps. While I was serving in the US Army during the Vietnam war era, after viewing nuclear war survival films, I later noted that the "plague" (fr., Gr. maggephah, a blow, slaughter) described in Zechariah (above) is the exact description of the effects of a nuclear bomb blast. I realized then, what most everyone now realizes, that a nuclear war is not survivable. 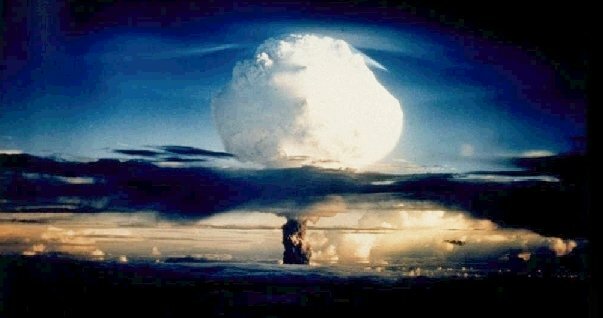 Zechariah, Ezekiel chapters 38 & 39 and the book of Revelation seem to powerfully suggest that there will be a great nuclear war in the last days just prior to the Lord's return. Why Wye now? After the nineteen month stall of the middle east peace talks, the Clinton administration managed to press Israel's prime minister Netanyahu and the Palestinian leader Arafat into an agreement at the Wye Plantation in Maryland Friday (10/23/98). This agreement precedes the final agreement, to begin in May of 2000, which will include the extremely sensitive Jerusalem issue. According to biblical prophecy, Jerusalem will be the subject that will ultimately end with Armageddon (Rev. 16:13-16). 2 "Behold, I am going to make Jerusalem a cup that causes reeling to all the peoples around; and when the siege is against Jerusalem, it will also be against Judah. Update: The Miami Herald (7/7/99) is quoted from Wednesdays edition as stating: "JERUSALEM -- Ehud Barak, Israel's former army chief of staff, assumed the ``historic duty'' of bringing the nation and its Arab neighbors a future of peace and security as he was sworn in as prime minister Tuesday...Barak has put together a seven-party coalition that hopes to negotiate peace with the Palestinians, Syria and Lebanon." Barak Defeated Netanyahu in the Israel Elections in May of 1999. With Barak expected to begin his Washington visit on July 15, 1999, the peace process is once again moving forward. Also, the final status talks, concerning Jerusalem, are scheduled to begin May 2000 (Zech. 12:2, 3).